Advanced reading copy reviewAuthor Julian Kulski was there. He was 10 years old when WWII began and Germany invaded Poland. By the time he was 14, he was working with the Polish resistance and being interrogated by the Gestapo. At 15 he was a commando in the hottest part of the Warsaw Uprising. He was captured and sent to a German POW camp where he spent the rest of the war fighting fever and famine. His book "The Color of Courage" (originally released as "Dying, We Live" in 1979)tells his story in journal form, written at the age of 17 in an attempt to purge the PTSD he suffered. It is a gripping tale, told well and quickly paced. For anyone with interest in Poland's role in WWII, this book is a treasure trove. Many photos throughout the book accentuate the story and pages of "digital extras" provide QR code links to websites and archives for further research. Julian never explains who was taking the pictures or how they survived but we're just glad they did. He also doesn't always tell us the fate of the people he fought with either, but probably because he doesn't know. All in all a welcome addition to any WWII library. A must read. My family was well-acquainted with a small Polish woman with a thick accent and a big heart. Lydia's stories of her activities as a member of the Polish Underground during World War II were heart-stopping. I cannot spell her last name, but she was a living hero to those who knew her in our small town of Hurricane, Utah. Everything she shared before she died is backed up by Julian Kulski in this book. The amazing courage of hundreds of teen-agers, and others, fighting desperately for their native land when it was overwhelmed by the converging armies of two megalomaniacs is as inspiring as it is heart-rending. The resistance in the face of brutal suppression, even when there was little hope, makes one hope he has a little Polish blood in him. The author gives many details of his interactions with Jewish friends, what happened in the Warsaw Ghetto, and how loyal Poles tried to help. His friends and loved ones, many of whom were taken by the Gestapo and never seen again, become a much more real than reading about the statistics of the war. He mentions how Poles who escaped to fight the Nazis in many parts of the world distinguished themselves as among the most effective units on many fronts in multiple branches of service among the allied forces...and how, after the war, communist Russia did everything they could to suppress their reputation of honor. Links to 11 videos on the net are included. In the Epilogue the author reminds us: "The fight for freedom does not cease with the winning or losing of individual battles, but is timeless. It does not take long to turn freedom-loving people into slaves...This makes me certain that no amount of effort, no amount of resistance, and no amount of tears is too much in defense of liberty." Although the book jacket states that the author was a child when he wrote this diary covering the years 1939-1945 (he actually reconstructed his daily life after the War, when he was 16 or 17); don't let that stop you from reading this. Kulski was the type of 10 year old who was already reading Zola among other things, and although his primary talents ultimately lay in the visual arts, he is a better story teller than most adults. Hence, the immediacy of the writing kept me on the edge of my seat.Kulski, who comes from a privileged non-Jewish background, makes it pretty clear that it was not only the Jews who suffered (although they were treated worse by the Germans). Rather than passively enduring occupation, the Poles of Warsaw managed to be a considerable thorn in the side of the Nazis for their determination to die rather than surrender. The diary captures the chaos of those times including the Blitzkrieg, the creation and burning of the Warsaw Jewish Ghetto and the ultimately doomed Warsaw Uprising of August 1944. Because Kulski was a 15 year old soldier in the uprising, he was captured and then shipped to a POW camp in Germany where he stayed until Liberation.I don't see this as a kid's book (although it seems like it is being marketed that way). However, it could be right up there with the Diary of Anne Frank in teaching high school classes about World War II. A remarkable book. I have read many books about WWII, and many about the Warsaw Ghetto, but this book is unusual in that the author, in his teens, is able to tell the book with an immediacy that is very compelling. He is able to describe a country that never surrendered during the war, but did not become free until the fall of communism in 1989. Poland was the only county during the war that was invaded by two countries -- Germany and Russia. A great read. This is the second book of his I've read (the first was a shorter paperback that was a general account of his time during the war, not in diary form), and this was again very well-written, fascinating, and emotionally draining. I'm left thinking about what I read long after I finished. I want to recommend it to everyone! 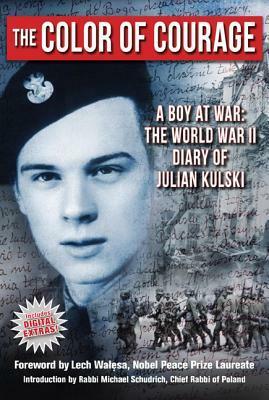 Kulski's diary doesn't seem to be written by a 16-year-old at the end of the war; it is a very mature account (to match his very mature actions during the war) that recounts very specific details from the August '39 to May '45. The richness in detail brings each day to life quite vividly, and you really feel how he was reliving the day through all of his senses. What many WWII books lack is a credible first-hand account that goes as deeply as Kulski's story does. Every event in Warsaw is brought to life through the eyes of someone who lived through the oppression, both mentally, emotionally, and physically. It's frankly unbelievable that someone can survive what the Nazis put that city through. It was eye-opening to read - and makes you see parallels, sadly, to events going on in the Middle East by ISIS. This book should really be read by adults and school children alike (high school age, perhaps?) as a valuable history lesson and learning tool to prevent it being repeated. Just a note: my parents know Mr. Kulski and lent me their copies of the books to read. That made me more eager to read them, of course, but I would review this book the same even if I knew nothing of him from real life. This book is fascinating and very inspiring. Written about a 15yr old freedom fighter, the author. Very well done and easy to read. Having visited Warsaw in 1973, still under Soviet rule and yet a beautiful city with the old town beautifully restored. Now reading about the uprising undertaken by sorely under armed boys and girls against well trained and armed regular German soldiers. The Germans had tanks, flame throwers, planes and bombs and yet the Polish youngsters made great strides for 2 months of unrelenting fighting. Where do you find courage like that? The Allies should be ashamed of how they failed the Polish people by turning a blind eye on Stalin--an even more brutal beast than Hitler. I read the entire book in two days. It's shocking to know children have to live through such horrors during wars. As written previously, it's impossible to write a review on someone's life, therefore all I will say is that this book is a revealing description of how civilians can collaborate in a context of bloodshed and courageously fight for their country, regardless of their age. Should be a staple in every high school library.